Get motivated by losing weight and working towards a goal. We take your results over 12 weeks, 8 weeks or 6 weeks. We have “finals” twice a year where the top 6 entrants can win amazing prizes at two of our biggest events. Other trainers are also welcome to enter their clients and just submit their client results to us. We have training camps available at La Como Fitness Club in Boksburg, at Man of Steel Fitness Club in Randburg and in a few other areas. If you cannot attend training at one of our location, we can offer personal training sessions with one of our qualified mobile personal trainers or send you a training program so that you can train on your own. You do not have to use our trainers or training program. other trainers can enter their clients and submit their results to us, or you can use your own trainer and just submit your own results to us. When entering any of the challenge options, you will be added to one of our trainers’ whatsapp groups or we will check on you on a regular basis. Should you have any questions about the challenge, your training or eating plan, you can also contact us or one of our trainers who will be more than happy to assist you. Prize giving will be done at two separate events in 2018; IFBB Boksburg Classic Fitness and Bodybuilding event on the 21st of July 2018 and at the IFBB Muscle Madness Classic on the 20th of October 2018. You will be entered into the competition closest to your entry date. Only your initial assessment results and your results after your 1st 6, 8 or 12 weeks per challenge will count towards the prize giving. Only the top 10 participants will be invited to the final prize giving and receive prizes on stage at the event (please note that you will not be competing in these competitions or be required to wear posing trunks or bikinis on stage, this is just a platform to tell people what you achieved in your 6, 8 or 12 weeks with us). Your weigh in results have to be maintained or bettered until the prize giving day or else you will be disqualified. No entry will be accepted without a complete entry form and full payment. Entrants who are chosen as the top 10 are required to maintain or better their results up to the finals. Should and entrant’s results not be maintained, he or she will be disqualified and a new top 10 entrant will be chosen to take his or her place. 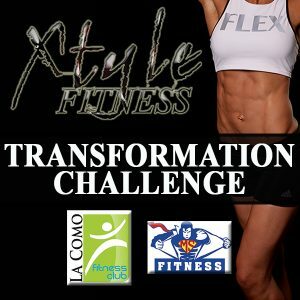 Xtyle Fitness reserves the right to change or substitute any of the prizes due to sponsors withdrawing from the competition. Prizes may also be added. All top 10 entrants must attend the final event they are registered for. All competition entrants will receive a certificate on completion of their challenge.